A couple of weeks ago, New Mexico officials warned that the President’s move to set aside nearly a half-million acres as a national monument would open up a crime corridor making it easier for illegal immigrants to cross the border and for drug cartels to operate undetected. Designating the area a national monument won’t protect it at all; it will do just the opposite. The National Parks, Forest Service, and Bureau of Land Management have known this for years… but evidently the Obama administration didn’t get the memo. Most homeowners would be infuriated to find numerous intruders trespassing through their yard, stomping on their flowers, and leaving behind a trail of litter. That is exactly what is happening along the border of the Southwestern United States, where illegal immigrants and drug smugglers are spoiling the precious homelands of indigenous creatures. Since the Border Patrol is outnumbered and underfunded, illegals are able to travel unimpeded on remote federal lands. The widespread harm being done to national parks, wildlife refuges, and wilderness areas is rarely reported in the news or mentioned in immigration legislation. Even normally outspoken environmentalists are strangely silent on the subject. However, illicit activities are ruining some of the most beautiful and fragile natural environments in North America. Illegal border traffic causes devastating effects on the vegetation, wildlife, and soil/water quality of sensitive ecosystems. Native plants, which are supposed to be protected by law, are suffering serious adverse impacts due to illegal border traffic. Mass migration destroys tender mountain meadow grasses, delicate desert wildflowers, and rare riparian greenery. A congressional study noted that the habitat of the Huachuca water umbel, an endangered plant found in Arizona’s Leslie Canyon National Wildlife Refuge, had been “trampled to death” (Segee 21). In addition, smugglers frequently cut down cacti and trees, sometimes to blaze new trails and other times to hinder the Border Patrol’s efforts to follow them. Beyond the direct injury to existing plant life, offroad foot and vehicle traffic prevents revegetation by compacting the soil or removing the nutrient-rich topsoil and exposing the hard mineral soil underneath, making it difficult for new plants to grow. Wildfires are another threat to native vegetation caused by extensive human activity along the boundary of Mexico and the United States. According to local firefighters, “nearly 75%” of the uncontrolled fires in Coronado National Monument have been started by cigarettes, matches, and campfires left by illegal border crossers (Hastings). Fires are often used for warmth, cooking, signaling, or as a diversionary tactic to distract law enforcement. Adding to the risk are “hundreds of vehicles, most stolen, abandoned by smugglers and other cross-border violators” (Terrell). Brush and forest fires that are fueled by gasoline and oil from the discarded vehicles not only contain hazardous materials, but spread more quickly, leading to greater resource destruction. Besides incinerating plants, wildland fires kill and displace wild animals. Some of the most pristine and valuable wildlife habitats in the United States are suffering the harmful effects of illegal activities due to their proximity to the international border. No place is more biologically diverse than the Coronado National Forest in southeastern Arizona. This region known as the Sky Islands consists of forested mountain ranges surrounded by seas of desert and grassland. More unique species of birds, mammals, reptiles and amphibians live here than anywhere else in the country, but the status of these creatures is extremely precarious. When their limited habitat is disturbed or fragmented, and when humans approach too closely or too often, the animals’ well-being is affected. Douglas, Arizona, is a southern gateway to the Chiricahua Sky Island area as well as a border crossing hotspot. In an Arizona Republic article, Douglas Mayor Ray Borane explained that law enforcement has driven illegal immigrants away from the city, but he said “they have still severely affected the presence of wildlife in and around the city of Douglas” (House). The overwhelming number of humans that distresses wild animals and forces them to vacate the premises also puts imperiled species in jeopardy. The U.S.-Mexico border is home to many threatened and endangered species, which are being further disrupted by the unprecedented influx of illegal aliens entering their territory. The U.S. Fish and Wildlife Service concluded that border-related activities were a primary contributing factor in the 79% decline of the critically endangered Sonoran pronghorn population between 2000 and 2002 (Segee 17-18). In Organ Pipe Cactus National Monument, an important habitat for the vulnerable pronghorn, the herd’s recovery will be hindered as long as “illegal border crossings and activities, including drug smuggling, occur daily” (NPS). Wildlife biologists, refuge managers, and volunteers have spent years working to save various species at risk of extinction, but much of their conservation work could be jeopardized by illegal border traffic. American citizens have long been reminded to “Leave No Trace” and “Tread Lightly” on public lands in order to minimize their recreational impact on natural resources such as soil and water. Illegal aliens, on the other hand, have absolutely no concern for the environment that they travel through. In California’s Cleveland National Forest, which is inundated with illegal border traffic, “hundreds of thousands of meters of new trail have been added and hundreds of thousands of square meters of ground have been disturbed” (McIntyre 404). All of these unauthorized roads and trails remove vegetative cover that holds soil and water in place, which changes the way water flows and increases erosion rates. Elevated erosion levels harm aquatic habitats by reducing water quality due to a rise in turbidity and sedimentation. In addition, accelerated erosion clogs streams, fills lakes, and carries pollutants into surface waters. America’s public lands have been polluted due to improper use as illegal aliens’ personal garbage dumps. Border litter (see photo) includes clothing, backpacks, blankets, water bottles, medications, hygiene items, empty food cans, glass jars, plastic bags, and paper. 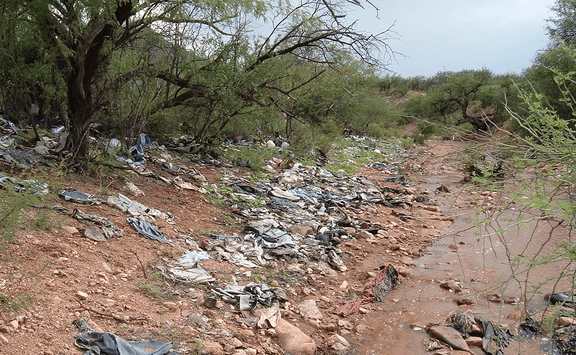 The Arizona Department of Environmental Quality estimates that “more than 2,000 tons of trash is discarded annually in Arizona’s borderlands” (ADEQ). Tragically, birds and mammals can die when they become entangled in trash. The Bureau of Land Management reports that “Big Horn Sheep have been known to ingest trash and especially plastic debris, and to have suffered death from inoperative digestive function” (BLM 22). Flash floods push the trash into nearby waterways, which are also contaminated by human waste from immigrants who congregate near wetlands such as springs, rivers, and streams. This pollution can have a catastrophic effect on animals that depend on a clean water supply. Clearly, the negative effects of illegal border traffic on the environment are dramatic. People who infiltrate the United States have no respect for the vegetation, wildlife, and soil/water quality of the sensitive areas that they traverse. The National Park System was established to preserve millions of acres of unspoiled wilderness so these natural treasures would remain that way for future generations. Non-citizens should not be allowed to overrun, trash, and destroy the public lands that legal residents pay taxes to protect. It would be a real tragedy for this generation to let America’s wildlife refuges become a sanctuary for drug dealers and illegal immigrants. The delicate balance of borderland ecosystems could take decades or even centuries to recover from this excessive mistreatment, and the full extent of the harm may never be completely understood. In any case, the damage from illegal border traffic must stop before the healing can begin. Note: This was a cause-effect essay written for my English 101 class.